Obviously it is an LNWR Coal Tank in LMS days on a motor train. But what is the date, the location, and the service the train is performing. 7710 was allocated to Willesden in 1945 although I’m guessing 1930s for the photo date. Could this be the Brighton side of Clapham Junction with the train an East Croydon to Willesden Junction service. I don’t think there was electric third rail on these through lines between the LNWR and Brighton systems used mainly by transfer goods traffic, but I’m unsure on this point. I would suggest that the location is Clapham Junction, with the train in the present platform 16. The elevated “A” box on the former LSW side is visible in the background, and the scalloped awnings are typical of LBSC stations in the London suburbs (they may well still be there today). The service must be from the West London line, but I‘ll leave it to others to give more details. 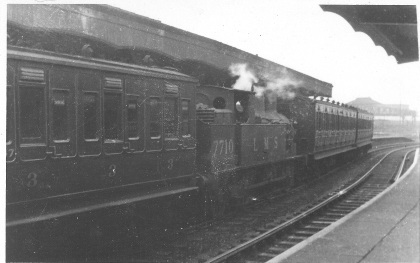 The service shown was that between Willesden Junction (Low Level) and Clapham Junction, which presumably commenced on 1 May 1922 and continued until October 1940. The Willesden Junction (Low Level) to Victoria (LBSC) and Willesden Junction (Low Level) New/East Croydon services that were in operation from 1 February 1872 and 1 May 1875 respectively, had been withdrawn as from 1 October 1917. The East Croydon service was re—instated on 1 May 1922 (one train only) and finally withdrawn from Monday, 4 March 1929 (in practice the last train ran on Saturday, 2 March 1929), I have assumed that the service post-war was for parcels traffic. This information comes from ‘The West London Railway and the W.L.E.R.’ by Borley and Kidner, published by the Oakwood Press. How excellent to see another photograph of motor train working in the Southern Division! For anyone not familiar with Clapham Junction, I can set the scene. Clapham Junction is actually two stations, side by side. The ex-LSWR station farthest away behind the train has 11 platforms in the Windsor and Main sections. Clapham Junction A SB seen hazily on the gantry in the distance controlled the north end of this station. The ex-LBSC station had four platforms on the Through and Local lines closer behind the train. The connecting line from Latchmere Junction on the WLER came underneath all LSWR and LBSC tracks and then curved round through the final two platforms seen here, joining the ex-LBSC Local Lines behind the camera at the ex-LBSC Clapham Junction South SB. In LBSC days these were platforms 10 & 11, but now they are 16 & 17. By 1922 there were crossovers at Clapham Junction North SB — out of view to the right — which allowed trains from Kensington and the WLER to arrive and depart from either of these two platforms. The motor train in the photo has undoubtedly arrived from Willesden and Kensington, through the facing crossover at North box, and will depart back the way it came. Until 1917 the LNWR Willesden LL and Croydon passenger service used these lines and platforms, as did the Eastbourne portion of the “Sunny South” from 1905. The LBSC worked goods trips from Norwood Yard etc to Lillie Bridge sidings on the WLER (south of Kensington) where they exchanged traffic with the GWR and LNWR. There were also some through milk trains. Even with these services, though, the connecting line was never very busy. The electrification of the Earls Court service in May 1914 released a number of motor trains, which were then redeployed. The Local Coach Working booklet of April 1915 shows two motor sets employed on some Croydon and Victoria services, but these ceased completely in October 1917 [LNWRS Archive MCIRC 056; TNA RAIL 410/1264 folio 322]. # one of our members has the July 1922 issue, and the December 1922 one is at NRM, each of which ought to confirm the service. By mid-1926 Willesden had three 4’6” tanks fitted with rodding for working motor trains, 729 (6587), 1008 (6551) and 2510 (6534) [list in LNWRS Archive, LOCO 189]. There is an undated photo of 2510 on a motor train at Clapham in the society collection [LNWRS/371]. It seems likely that these worked the Clapham Junction trains regularly, as there were no other motor services in the area at that time. 1008 was withdrawn in June 1927, but the other two may have continued at Willesden a little longer. Are they shown in the Feb 1928 list in box 4 of the Charles Williams papers at the NRM? Between 1926 and February 1928 Coal Tanks 595/6 (7793/4) had been transferred to Willesden, having previously been equipped with rodding in 1925, and presumably also worked on the same service [LOCO 189 and “Bashers, Gadgets etc” by Pete Skellon]. There is a possibility that Coal Tanks were preferred to 4’6” tanks on “double motor” trains. Returning to the subject of the photo, Coal Tank 7710 (ex-LNWR 796) was fitted with rodding and painted with its LMS number in September 1927. In 1926 it had been allocated to Mold Junction (shed 37) and then in February 1928, after fitting, to Walsall (shed 9). It is said to have been transferred to Northampton the following month [LNWRS Journal vol 3 no.4 p139] and then to Willesden (shed 2) from January 1929 [“Bashers, Gadgets etc” p107]. It was away from Willesden for a few months around March — April 1931 when it was fitted with the LMS standard vacuum controlled regulator gear (VCR) in place of the ex-LNWR rodding, but then remained there until after 1940. It seems very likely that this was the date when the services operated from Willesden shed were switched over from rodding to VCR, as VCR—fitted 7700 arrived there from Huddersfield around the same time. These two engines continued to work the WLR service from 1931 until the second war [R.O. May 1937], with the addition of 7751, fitted in February 1934. Also, 5’6” tanks 6676, 6722 and 6729 were fitted with VCR in February — March 1931 and allocated to Willesden (shed 2) by 1932. 6682 and 6692 were fitted in September 1932 and also went to Willesden. It is not clear which services these engines worked, and they may have actually worked from Watford Junction (shed 2W); by summer 1935 6729 was the only 5’6” tank left at Willesden, the others having gone to Watford, Bletchley and Sutton Oak. Under the LMS organisation Willesden became shed 1A and Watford 1C in 1935, and from then on the separate allocations are much easier to distinguish. The coach to the left of 7710 is an arc roof 8-compartment third of diagram M62. The number ends in a “7” and almost certainly in “47”. The only vehicle to match this was M62 5347 (ex-LNWR 1046), which had an interesting history. It was built as a D289 Third, and converted with rodding in 1911 to form part of Earl’s Court motor set no.2, ready for the new motor service of 1911/12. It was paired with 2947, a M33 vehicle which had been part of the original Stanmore set of 1909-11. They worked the Earl’s Court service until electric trains were introduced in 1914, and then moved up north to become Kirkburton Set No.1 when motor train working on that branch was introduced in 1916. Subsequently they were denoted as Composite Motor Set No.13 when these designations were introduced about 1918/19. [much of this info courtesy Philip Millard]. It is very likely that they were refitted with VCR in Dec 1927 or Jan 1928 at the same time as engines 7700 and 7752. Passenger services on that branch ceased in July 1930, and the set seems to have returned back south to Willesden in early 1931, to assist with the changeover to VCR. 5347 may have still been coupled to M33 driving trailer no.2947, now LMS 9512, but that is just speculation. The coaches to the right are another 8-compartment M62 or M63 and an unidentified driving trailer. Thus the photo must date from after April 1931, but before the 1933 renumbering of carriages. I regret that I do not have any Passenger WTTs from this period, and cannot say how many motor sets were then in use. By then the Croydon service had ceased. There is another photo of 7710 working “double motor” at Kensington in 1933, taken by H C Casserley, published in LMS Journal No.2 p43 and in “Bashers, Gadgets etc” p107. The date is stated in one to be March, and in the other August. It may even have the same coaches, but that is also pure speculation.